I've said it before and I'll say it again, what I would have done for the internet when I was living in England. I had almost no resources to find groups like this and they would have been a god send. Well I learned something new tonight, I did not know there were bonfire societies in Britain. I wonder if its a "Southern Britain" thing, I'm from Northern Britain. Smitten: Yes, it is nice to meet a friendly face, even if it's one you just know from the Internet. As much as I moan about having no friends here, I seem to be trotting off to meet people on a regular basis. Gill: I don't know about the north, but there are loads of them down here in the south. Bonfire is very much a Sussex tradition (there is one Bonfire Society just over the border in Kent), and is centred on Lewes because Lewes is the County Town of Sussex, and it was here that 17 martyrs were burned by Mary Tudor (not personally, you understand; somebody else struck the match) between 1555 and 1557. 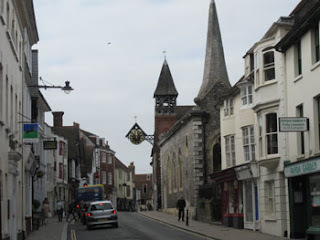 Lewes has always been a hotbed of nonconformism and radical thought - it was here that Tom Paine first learned to write about political matters - and when Lewes decides to have flaming torches, fireworks and hundreds of costumed people filling the streets, not even reading the Riot Act (which was once tried, and the smugglers' costumes originated as disguises so that participants could not be identified and arrested) can stop it happening. But that's enough from me, or this comment will be longer than your blog! Communication was fine, Molly! At one point we simulataneously worked out the solution to the problem of 'Life, the Universe and Everything', but unfortunately forgot to write the answer down. > I wonder if its a "Southern Britain" thing, I'm from Northern Britain. 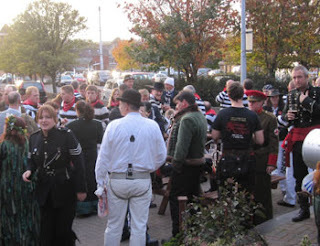 Gill, it's certainly a South-Eastern thing, as Molly says, though over in Ottery St Mary in the West Country they have a tradition of burning tar barrels like we do (and they also seem to wear striped jerseys. 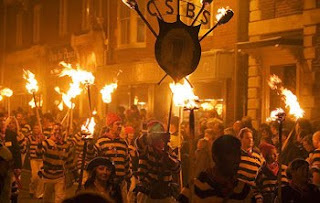 See http://www.otterytarbarrels.co.uk/ ). But I don't think they have Socieities like we do. In the Lancashire of my boyhood Bonfire Night was celebrated by street parties, neighbours getting together to provide a small bonfire, fireworks and food (chestnuts, baked potatoes, meat-and-potato pie and parkin were the traditional fare). I'm not sure about the extent Guy Fawkes Night is celebrated in Scotland. Although King James, whom the conspirators tried to assassinate was king of both England and Scotland, it was only the English parliament -- not the Scottish -- that they tried to blow up. I never knew such groups excisted! I'd put money on the fact that many of them are single. And a bit sad. Imagine meeting the man of your dreams to find out that he was chairman of the bonfire society and dressed up like a smuggler on weekends. Great Article Mike! You are becomming more limey-like every post I read! Molly: Thanks for the info! I should have talked with you about it before things got hazy. Pam: Thanks! Am I an honorary Limey now? > I'd put money on the fact that many of them are single. What a cool event! Great photos and information. Wish I'd been there. For Howard: Sincere apologies. Sounds like you all had great fun.